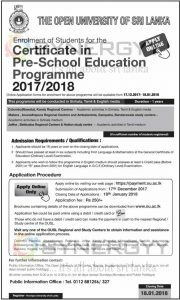 The Open University of Sri Lanka invites application for the Certificate in Pre-School Education Programme 2017/2018. Should have passed at least in six subjects including First Language & Mathematics at the General Certificate of Education (Ordinary Level) Examination. Applicants who wish to follow the programme in English medium should possess at least a Credit pass (Before 2001) or “B” pass (from 2001) for English Language in G.C.E (Ordinary Level) Examination. Those who do not have a debit / credit card can make the payment in cash to the nearest Regional / Study centre of the OUSL. Visit any one of the OUSL Regional and Study Centers to obtain information and assistance in the online application process.